Up until recently, Madrid’s Hinds were called Deers… that was until Montreal band The Dears made them change it. (A “Hind” is a female deer, by the way, so they stayed close to the source with the new name.) Whatever you call them, the band make endearingly shambly surf/garage pop, not too far from The Pastels (as Bobby Gilespie mentions above) or The Beets. 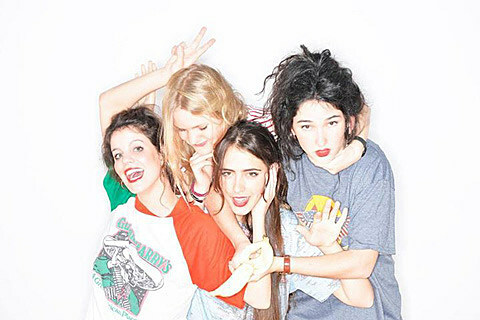 So far Hinds have two singles, both of which you can stream, along with videos for the very catchy “Bamboo” and “Castigadas en el Granero,” below. Hinds will be visiting North America in March for SXSW and Burgerama, with a tour bookended by NYC shows: March 13 at Baby’s All Right and March 31 at Mercury Lounge. Tickets to Baby’s All Right go on sale at 10 AM on Friday (1/30) and tickets to Mercury Lounge are currently on AmEx presale and go on sale to the general public on Friday at noon.